Personalized Rustic Wood Cabin Canvas Print - - Highlight your away-from-it-all spot with a piece of personalized wall art. Great gift for a friend who invites you to share his or her rural retreat. 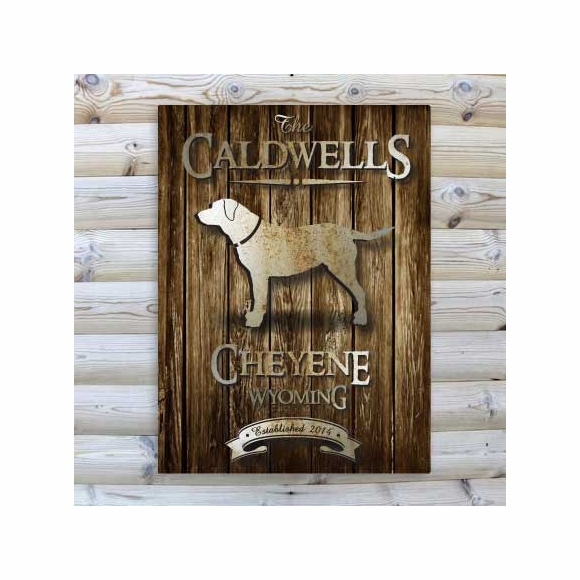 Your name, town, state, and "established" date are printed on canvas with your choice of rustic-theme image in the center of the canvas. Text and central image are printed on a background that resembles rustic wood. Personalize with Name up to 20 characters, Location line 1 up to 20 characters, Location line 2 up to 20 characters, and 4 digits for year. "The" at the top of the canvas is standard unless you tell us to exclude. See Trout image (Big Al's) for an example. Images: labrador, loon, moose, oak leaf, wood duck, stag, trout, spruce, walleye (small images above are in the same order as this list). Please provide personalization exactly as desired in designated boxes, including any punctuation in the name.